Even though the activity in the industry is increasing after a long winter sleep, the activity is still low compared to the march of 2017. I will not speculate here about the possible reasons. The good news is – a couple of programs with interesting legends have joined DavidNews.com monitor in the past days. It’s not that they are somehow better, but I believe we want to hear something different from time to time. In fact, today’s program is not your usual cryptocurrency story. The program is called Transport Alliance. It joined the Sticky listing on DavidNews.com monitor 7 days ago. In total it has been online for 18 days. Now I have reinvested in this HYIP $200 and will keep you updated with the payment status in the following days and weeks. Transport Alliance investment plans look quite generous to me for a program, which is offering forever plans. It is offering 4 investment plans with interest rates 8%, 9%, 10% and 11%. All four plans have no deposit term and the initial deposit is included in the above-mentioned interest rates. If we take a closer look at these plans we realize that the highest potential of attracting a significant number of investors has the first plan with a minimum deposit of $25 and a maximum deposit of $4999. In this plan, the deposit would reach the break-even point within 13 days and after that, the deposit would start generating real profit. Accruals are calculated daily and are available for withdrawals daily as well. Admins or copywriters have done very good job with the HYIP biography because I’m sure that there are many cargo shipping companies which could learn from Transport Alliance how to write a good About Us page. This legend was like a fresh breeze among cryptocurrency inspired legends. Of course, when I see HYIP with legend about cargo shipping I start judging and ask why any cargo shipping company would create a HYIP. On the other hand, I’m sure that most of the crypto trading inspired HYIP’s don’t do any trading, but since it’s the time of the crypto rush it sounds more possible and related to HYIP business. Keep in mind that an everyday number of HYIP’s stop paying. Believe me, the legend is not something that will define if a program stops paying or not. 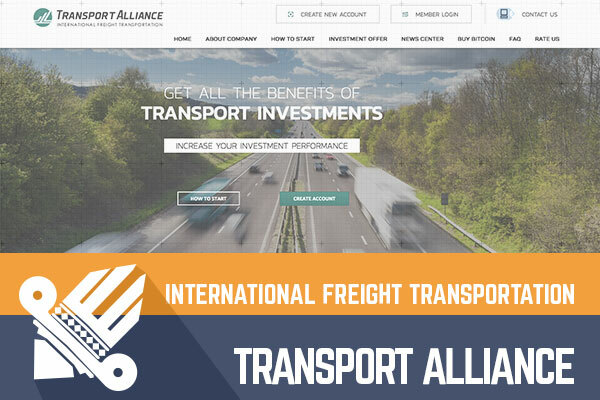 Homepage of the Transport Alliance website is well designed. All major facts about the investment plans right after the slider. Easy to use calculator can be found on the same page. Just type in the deposit and calculator will do the magic – show daily, weekly and monthly profit. Don’t forget it’s not actual profit and your deposit is included in it. Basically, you can find all important information within a few scrolls and without leaving the homepage. It’s convenient for me! Transport Alliance has a Facebook account with a few posts ant 59 like and a Twitter profile with 17 followers. Admins or the team hasn’t been very active on these profiles. I did check forums and found only some random thoughts about the program. Some guys say that with such generous rates you should jump on the train at the beginning or better let it go… On the 12th of March, the program is still paying and there must be some guys already making a profit. For the first investment plan, it takes 13 days to reach the break-even point. If you are among them, drop a message in the chat box and let our readers know how it has been performing so far. The website is built using licensed Gold Coders script. The design of the website doesn’t look familiar to me, but I could be mistaken because I didn’t check websites of famous cargo shipping companies. SSL certificate from Comodo is valid until the February of 2019. As I already mentioned, there are 4 different investment plans and it’s very easy to choose one among these plans. Either the amount of the deposit fits the minimum-maximum deposit range of the plan or not. For example, $200 are in the range of $25-$4999 and my deposit was made in the first plan. After 13 days since the beginning my deposit would reach the break-even point and after 25 days of investment, I would make a net profit of $200. Of course, only in case, the program will not collapse during these 25 days. Minimum withdrawal is $2 for PerfectMoney, AdvCash, and Payeer, but $8 for Bitcoin and Litecoin. Withdrawals are being processed automatically. Admin on the FAQ page has mentioned that maximum withdrawal processing time is 24 hours but from my personal experience, they were processed in less than an hour. Today the program has status “Paying” and for my deposit, it takes another 6 days to reach the break-even point. So far, I haven’t had any trouble with withdrawals. As I said, these plans look very generous and It’s hard to predict which direction will the wind blow. Therefore, if you ever decide to make any investments, don’t invest more than you can afford to lose! Have you already made an investment in Transport Alliance and have any useful information to share with us? Please drop a message in the chat box to share your experience! Investment plans: 8% Daily Forever ($25 - $4,999), 9% Daily Forever ($5,000 - $9,999), 10% Daily Forever ($10,000 - $24,999), 11% Daily Forever ($25,000 - $50,000). Principal included in profit. Join 1,000,000's who have already found easier strategies for investing in LiteCoin.